Up to 25% Off - 4BR Golf Course Front Home at Bay Creek Resort! SPECIALS: EVERYONE DESERVES A VACATION, EVEN IN THIS ECONOMY. ENJOY ALL OF THE PLEASURES OF BAY CREEK AND TAKE ADVANTAGE OF OUR RATES WHICH ARE DISCOUNTED UP TO 25% FOR 6 OR FEWER GUESTS WHEN COMPARED TO LARGER GROUPS. THIS MAKES OUR RATES ONE OF THE BEST VALUES OF ANY HOME OR CONDO IN THE RESORT. Experience the Eastern Shore way of life at the Pinnacle House: Situated in the Bay Creek Golf and Marina Resort, Cape Charles, Northampton County, Virginia. The Pinnacle is a touch of paradise on the edge of the mid-Atlantic’s most beautiful new golf courses. 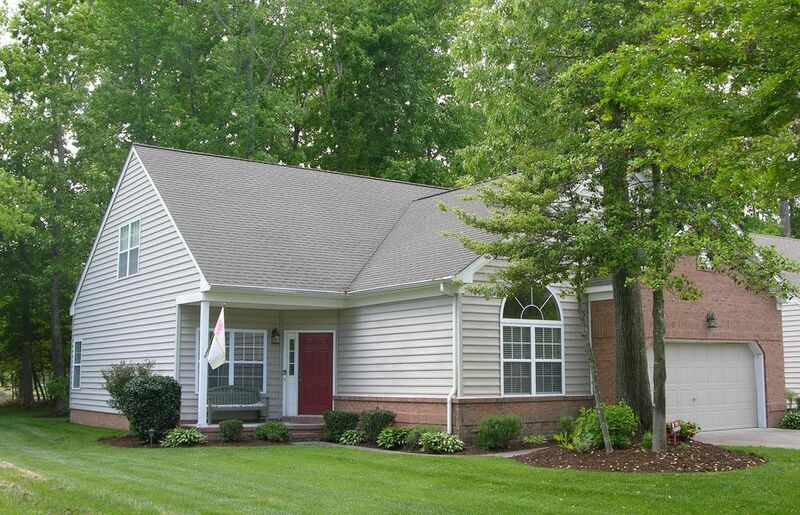 The quiet cul-de-sac setting in a gated community is ideal for great golf or family get-aways. This 2300 square foot home features a spacious and open floor plan. With three bedrooms downstairs, and one upstairs, the Pinnacle comfortably sleeps ten. The open floor plan features dramatic vaulted ceilings within the Family Room with fireplace, large flat screen TV, DVD, and a wall of windows that allows a great view of the natural setting. The Pinnacle backs right up to Hole #1’s Tee-Box on the Jack Nicklaus Signature Golf Course. There is no reason to get in your car; just walk right out the back door with your clubs in hand. The Home features Four Bedrooms and Three Full Baths. The Bedrooms are setup as follows: Downstairs Master Bedroom has one Queen Bed, Upstairs Bedroom has one Queen Bed, Two Downstairs Bedrooms with two Twin Beds each, and Upstairs Loft has one Full Bed Futon. A graciously equipped eat-in full kitchen provides a delightful area for a leisurely breakfast or a no-fuss meal. Gather around the spacious dining room table for more formal meals or a family board game. When you’re tired of the kids, the in-laws, or your golf buddies, send them upstairs to hang out in the loft, a separate area that provides a whole other upstairs environment, adjacent to a huge bedroom and another full bath. The loft also has a Foosball Table and Slot Machine for your enjoyment. Free high speed Internet is available via a wireless network. Free nationwide calling is included and cable TV is available on 3 flat screen TV’s throughout the home. Step out back onto the large screened in porch, where you can relax while watching the sunset through the trees. With a spacious garage, Jacuzzi tub, and a washer and dryer, you’ll feel right at home. This gem is within a Two minute walk of the Golf Pro Shop, Coach House Tavern, and Golf Driving Range, a Five minute walk to the Pool and Tennis Courts, and just a Ten minute walk to a private white sand beach on the Chesapeake Bay is ideal for a day in the sun or savoring one of Bay Creek’s famous sunsets. Please note that Pool access is to the Community Pool as shown in the photos and does not allow access to the private membership Beach Club Pool. Enjoy bird watching (over 200 species have been sighted at Bay Creek), biking, walking nature trails, as well as fishing, crabbing or clamming in the bay. After dark, enjoy the atmosphere and splendor of the night skies due to the 'dark sky' neighborhood program. Amenities include the award-winning Arnold Palmer Signature Golf Course (rated as a top TEN new course by both Golf Magazine and Golf Digest, and top 100 course in America by Golf Digest), Jack Nicklaus Signature Golf Course (rated as the TOP new course on the east coast by Golf Digest), a world-class marina, community pool and tennis courts, all within this spectacularly landscaped community. One mile away is Cape Charles’ charming historic main street featuring coffee house, pub, bait shop, antiques, miniature golf, and other fine shops and restaurants. Within a short distance is an abundance of eco-tourism opportunities including hiking, biking, kayaking, canoeing, hunting, and fishing. The Shore is dotted with small towns ripe with antiques and local points of interest including three wineries. Take a 30 minute drive across the Chesapeake Bay Bridge-Tunnel and experience the excitement of this metropolitan resort area including the all new Virginia Beach Boardwalk and oceanfront and the acclaimed Marine Science Museum. Home to the Tides baseball team, Norfolk features the spectacular MacArthur Mall, upscale shopping at its best, as well as The Chrysler Museum, Nauticus Maritime Center, Harbor Park, and Waterside. Colonial Williamsburg is a great day trip from the Shore. Please note that we only allow Saturday to Saturday rentals during the summer months, unless we have an opening that is close in time of your requested stay. We live near Annapolis, MD, and thoroughly enjoy the relaxation of Bay Creek in Cape Charles. Cape Charles offers visitors a step back in time to a quieter life with many stores, restaurants and services to enjoy life on the Chesapeake Bay. The town is home to one of the largest concentrations of late-Victorian and turn-of-the-century buildings on the East Coast, and the entire downtown district is listed in the National Register of Historic Landmarks. Cape Charles is a resort town, where golf carts ride on the street and kayakers pull up on the beach. Since Cape Charles is located on the western coast of the Eastern Shore, the sun sets on the water every night, displaying an incredible meltdown of oranges, purples, and blues. The nights are calm and peaceful, filled with the sounds of nature everywhere. Located directly on the Golf Course just a few hundred yards away from the clubhouse, and within walking distance of the community pool, tennis courts and the prestine private white sand beach of the Chesapeake Bay, simply park your car and either walk or ride one of our bikes to all these great activities. Bath towels, Hand towels and wash cloths provided; Beach towels are not provided. (3) The Family room has a High Definition 42' flat screen and there is 32' flat screen TV in each of the two Queen Bedrooms.. The family Room has a Blu Ray player and the upstairs queen bedroom has a standard player. There are Bicycles, Beach Chairs, and Fishing Poles for Guest Use. We had 6 golfers staying at the house. This was our 4th year staying here. The owner is great to work with and takes care of the property. The house is in a great location and had everything we needed for a comfortable stay. The house is located by the 1st hole on the nicklaus course which was short walk to club house. The house is well equipped and nicely furnished. We are looking forward to a future stay.!!! good restaurants, very good golf courses and friendly people. The house was well cared for, clean and comfortable. It's location is a big plus because we are avid golfers and the two courses in Bay Creek and excellent. We had to buy our own bath soap and tissues. Other than that it was furnished with everything that you would expect. Great house, would stay here again! The house was a perfect fit for our two families. We had a great time playing golf and exploring the eastern shore of VA.
You will have access to Bay Creek's private beach, tennis-courts and swimming-pool. Visa and Mastercard are accepted. We only allow Saturday to Saturday rentals for the months of June, July and August.